Image: Asada Nami/Shutterstock. Design: Ashley Britton/SheKnows. From the first moment your newborn baby is placed in your arms, what they eat is one of your biggest concerns. Breast milk or formula? When should you wean? And what do you do if you have a picky eater who won’t eat anything you put in front of them? An issue that’s not often tackled is why a child is hungry all the time. While some kids might simply have a healthy appetite, an insatiable hunger could be a sign that there’s something else going on. Here are five common reasons some kids are always hungry — and some expert tips for solving the problem. Emotional eating isn’t an issue for adults — children often display this type of disordered eating behavior too. 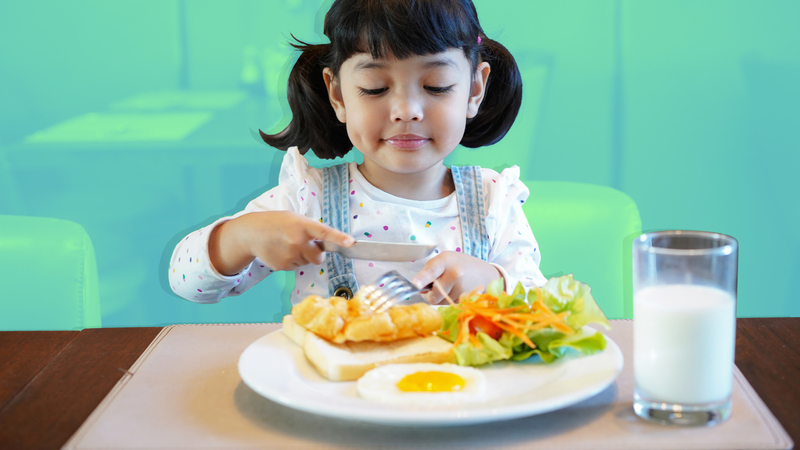 “Kids who are hungry all the time might turn to food for comfort when they’re anxious, stressed or upset,” Danelle Fisher, M.D., vice chair of pediatrics at Providence Saint John’s Health Center in Santa Monica, CA, tells SheKnows. If you think your child might be eating for emotional reasons, this isn’t necessarily “bad,” but it can become an issue if eating is the only way they deal with their emotions, says the Academy of Nutrition and Dietetics. Start by talking to your child to help you identify what feelings are behind their desire to eat: boredom, anxiety, confusion, loneliness, excitement and insecurity are some common ones. Suggest other things you and your child can do together instead of eating, like going for a walk if the issue is boredom, or playing a game if they’re using food to deal with loneliness. According to a study led by University College London, published in the journal Pediatric Obesity in June 2018, the tendency for children to eat more or less when stressed and upset is mainly influenced by the home environment and not by genes. If this theory is true, it’s crucial that you set a good example for your kids by developing a healthy relationship with food. It’s there to nourish your body, not take away stress, sadness or loneliness. A regular routine of eating as a family at the table is important, as is letting kids decide when they are done eating. Again, be aware of your own relationship with food — if you restrict your intake then over-indulge on treats, there’s a good chance your kids will follow in your footsteps. You might have to get a little creative to ensure your kids eat their veggies. “You’d be surprised what a little flavor can do for a kid’s interest in crunching on broccoli,” registered dietitian nutritionist Rebecca Scritchfield tells SheKnows. She suggests serving veg with ranch dressing, sesame soy dressing, vegetable dip or guacamole. If your kids doesn’t like the foods you give them at mealtimes, they’re likely to take a few bites, say they’re full, then come back to you an hour later asking for snacks. Your kid can still get the foods they crave the most, such as chocolate but try to aim for better balance. “Use your power of suggestion and say, ‘You know what, I can give you some yogurt with chocolate chips in it or a banana with peanut butter and a few chocolate chips. Which one sounds good? '” suggests Scritchfield. For this one, there’s no magic fix. Simply continue to feed your kids on a routine, let them regulate their intake, provide filling, nutritious, varied foods — and watch them grow! If you’ve exhausted all possibilities and your child continues to be hungry all the time, it’s time to get some professional advice and support. Fisher advises consulting your pediatrician to rule out a medical condition, and working with a nutritionist to figure out the right course of treatment.